Put “Tony Abbott’s” into Google and it may as well use autocomplete to suggest you search for his daughters first and second for his policies. It’s obvious that both the public and media have a weird fascination with Abbott’s daughters. With the election looming, Harper’s Bazaar decided to feature Frances and Bridget Abbott, the youngest of his three daughters, in a fashion spread in early August. It was an early indicator of the media fixation that deepened after the election date was named for September 7. Since then, the duo have been featured or discussed across major newspapers, media sources such as Mamamia, television, and on radio Katy Perry told Tony Abbott she wanted to meet them. With deft depersonalisation, a Sydney Morning Herald columnist declared, “Abbott unleashes his two weapons of mass distraction.” The Daily Telegraph echoed the tasteless metaphor, dubbing them Abbott’s “heavy artillery” in winning ‘the female vote’. The notion that Abbott having daughters clears him of misogyny has been parroted incessantly since Gillard’s verbal flaming in October last year. The glaring hole in this logic was quickly recognised: having daughters hardly makes a man incapable of misogyny. Frances and Bridget Abbott’s salience in the Liberal campaign is calculated to show that Abbott doesn’t just have daughters but that they are articulate, groomed, likeable women. It’s easy to be a misogynist and a father but harder to be a misogynist and a good father – though, by no means impossible. Both women also appear to have been raised to think independently and have been vocal about their personal views in the media. This is support masqueraded as dissent. Undoubtedly sanctioned by campaign management, they are being used to reassure voters that Abbott won’t impose his conservatism upon the public. In contrast with their father, both Frances and Bridget Abbott have stated their support for gay marriage. This stance might well be genuine, but even if they weren’t, saying so is sharp and deliberate political strategy. It gestures towards a future under an Abbott government where progressive legislation might be passed, quieting the voter unease about his anachronistic ideas – but it’s all suggestion. 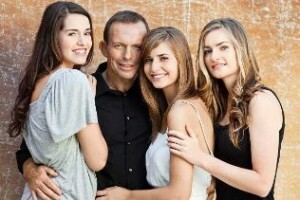 Abbott doesn’t need to commit to any sort of progressivism because his daughters are doing it for him. In contrast, Jessica Rudd occupies a much smaller space in the current political arena. 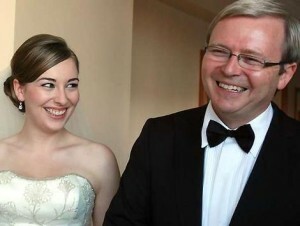 In fact, her Google autocompletes include ‘is Jessica Rudd Kevin Rudd’s daughter?’. Unlike Abbott, there is no pressing imperative for Rudd to use his daughter as political band-aid for holes in his social policy. Jessica Rudd infrequently plays a part in trying to humanise her father; pictures of the two of them together with her young daughter are perhaps a hopeful attempt at getting the public to forget the rumours of bad temper and difficult character that have plagued Rudd’s leadership. Yet, unlike Frances and Bridget Abbott, whose belief in marriage equality became well-publicised, Jessica Rudd’s support for marriage equality barely made ripples in the media. Rudd didn’t need it to; Abbott did. Rudd has many flaws, but so far none of them have required him to use his daughter as a temporary, and ultimately meaningless, proxy.